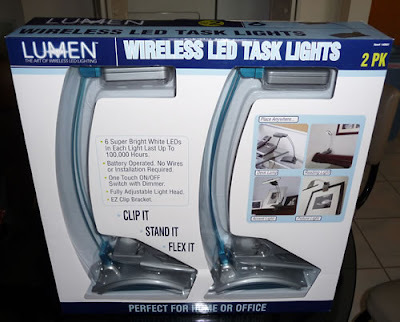 Normally I don't go down the office supplies aisle but today I did, and wound up with these wireless LED lamps. I figured these would come in handy and for $19.99 a pair, how could I resist? For sure I can use one by the main computer when I need more light, rather than turning up the halogen lamp and setting the house on fire. Then environmentally conscious me threw these reusable Costco shopping bags into the cart. I saw these long time ago and thought they were ugly, but I was reading a Costco blog the other day that raved about how useful they are. I didn't realize you get three bags for $3.49, not just one. So today I asked one of the employees if they still had it and she told me their exact location. The bags are very roomy - Costco knows how much stuff goes in them! Now I just need to remember to use them and not forget, like I do with my Trader Joe's canvas bag. Ooh, these peaches looked too good to pass up so in they went, too. $7.49 for 11 large ones which I dunno if that's a good price or not but they were too tempting. Unfortunately they are not like the name on the box - they aren't ripe enough yet. 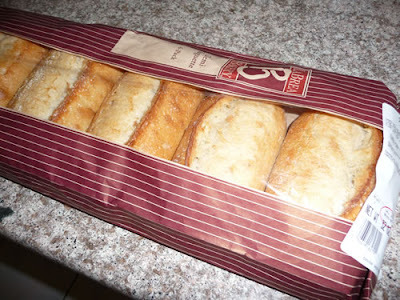 I also love these small baguettes that use La Brea Bakery's recipe but are made fresh at Costco and put on the shelves while they are still nice and warm, the moisture from the bread still condensing inside the bag. And after debating between the Kirkland and Milton brands of whole grain bread, I chose Milton even though it cost over 30% more. 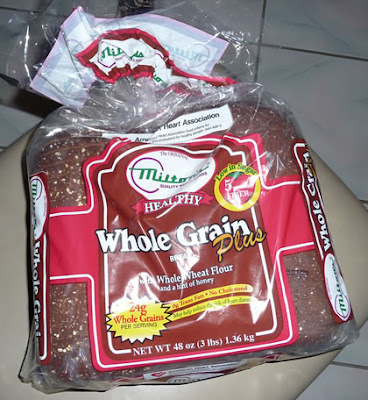 Looking at the nutritional information, the Kirkland whole-grain bread has 50 more calories per slice than the Milton's, yet they are substantially the same nutrition-wise. The Kirkland slices are bigger, though. Now you might point out that here I am debating over 50 calories between the two whole grain breads, yet I unhesitatingly put the baguettes made from white flour in the basket without blinking. Well, there's no nutritional information on the baguette package so what I don't know won't hurt me. 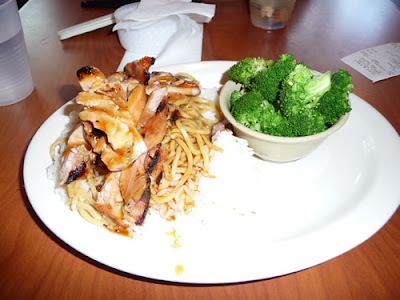 For lunch, Julie and I headed out to Teri and Yaki's, aka Himeko Chicken, in Monrovia. Of the various fast food teriyaki places, I like this one the best because the sauce isn't overly cloying or sweet and they put a reasonable amount of it on instead of drowning the chicken in big glops. 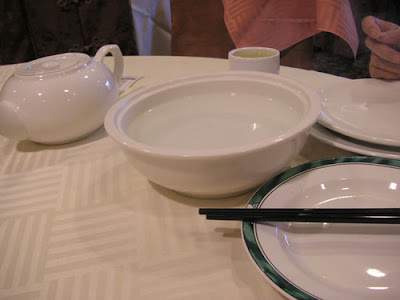 They also have a better selection of side dishes and the rice has the kind of texture I like (more like Japanese rice). Here's some of the sides. The guy thought I was weird taking pictures. I know I am! 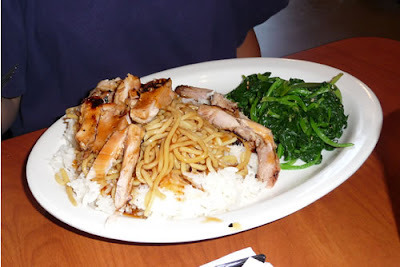 And here's Julie's plate - the basic chicken, with noodles, white rice and her side of spinach. 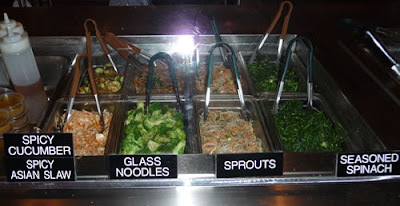 Mine is the same except I opted for broccoli instead of spinach. This evening we had dinner with Julie's family. 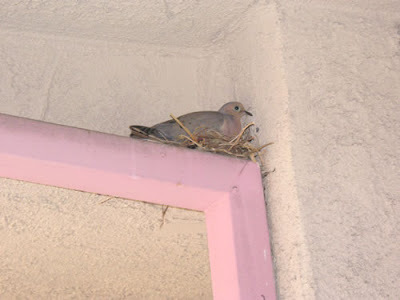 When we got to her mom's place, I noticed there was a bird nesting above the garage so naturally I had to snap a picture of it. It just sat there and cooperated. Looks kind of dumb, doesn't it? It must have been naughty since it's facing the wall. 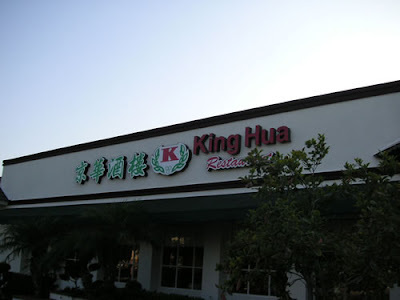 We went to the recently-opened King Hua to eat. The location used to be occupied by Sea Star (which was pretty bad and I would refer to it as Sea Slug), then it became Ritz Gardens, but that closed down earlier this year. Ritz Gardens was also pretty horrible. 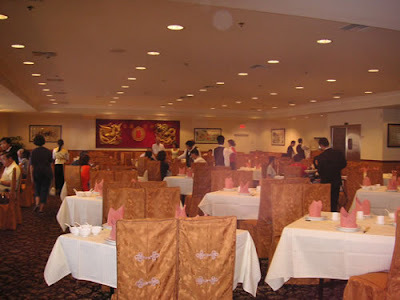 That was the usual Saturday night gathering place with Julie's family and often we were the only patrons. Well at least there was no waiting. But the inside is completely different. It's a lot fancier now, as you can see in the picture below. They also seem to have spared no expense on the wait staff, which was abundant and attentive. The only holdover employee from the former Ritz Gardens is one of the captains, who lives in the same condo complex as Julie's mom. If you're wondering what that is, like some fancy Chinese consomme or something, you be wrong. It's a bowl of hot water. I guess the camera didn't capture the steam still rising from the bowl. Julie's mom and sister use it to soak their food to get off all the grease. The captain remembered their habit from the old place and kept the tradition by bringing the bowls out in the new place as well. Yes, I've asked what is the point of ordering a specific dish if you wash all the flavor off of it, but they do it anyway. I should have taken a picture of the bowl after dinner but I forgot. It wasn't pleasant. Now for the real food. I'm just posting pictures of a couple of things, because these were the only two things I thought were good. First, scallops with walnuts. The walnuts tasted stale. 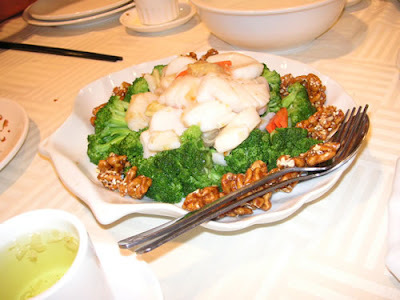 The scallops were fine but what I really liked was the broccoli. 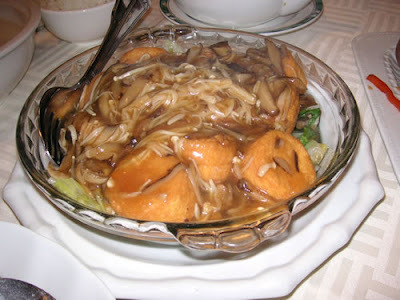 The next dish is tofu with shredded mushrooms. This was my favorite dish of the evening - the tofu was very tasty and the mushrooms were a good complement. As for the other dishes, they were meh. 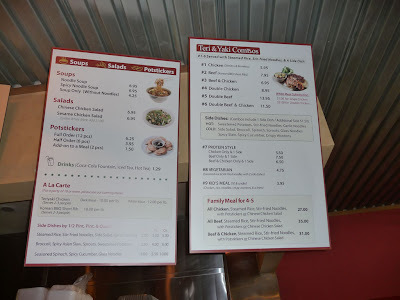 There was nothing wrong with them but the flavors were on the bland side, plus the prices were on the high side. As you can see from the picture of the dining room, they do have a lot of overhead to cover. I don't mind going there on someone else's tab, haha, but on my dime - I'd pass. And that was the stuff that happened Saturday. I like Costco a little too much and am headed there as soon as they open to pick up some photos. Did you get their 50 free prints offer? I've been thinking about buying the booklights for the kids and taking them to The Yard on Thursday. I hope they are working for you.